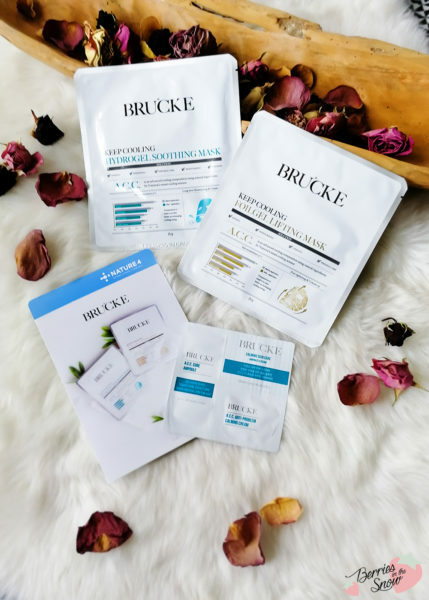 BRUCKE is a new KBeauty brand based on oriental medicine, combined with the practical diagnostics of western medical sciences. Their motto is “Heal Your Skin” and the products are designed to improve problematic skin and increase the immunity of it. Their key complex is the Advanced Cooling Composition, called A.C.C., which is extracted from natural herbs to keep the skin at the optimum temperature. It also has other effects like anti-inflammatory properties, sterilization, etc. 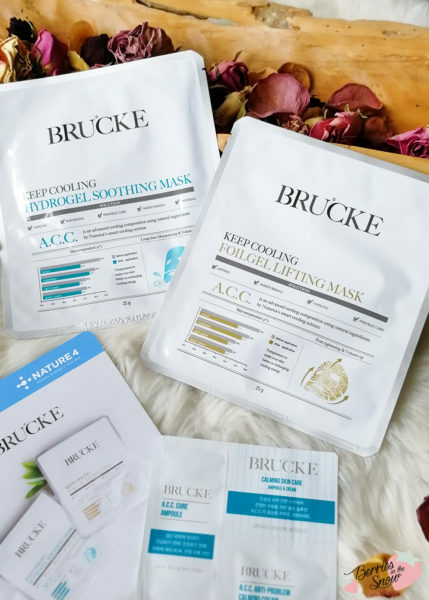 There are two BRUCKE Keep Cooling MAsks: The BRUCKE Keep Cooling Hydrogel Soothing Mask and the BRUCKE Keep Cooling Foilgel Lifting Mask. As you can see the design of the brand is simple and tries to look kind of science-y, showing diagrams of the temperatures of different facial areas before and after application. The BRUCKE Keep Cooling Foilgel Lifting Mask is designed for pore tightening and volumizing. It has lifting, moisturizing, cooling and wrinkle-care properties. 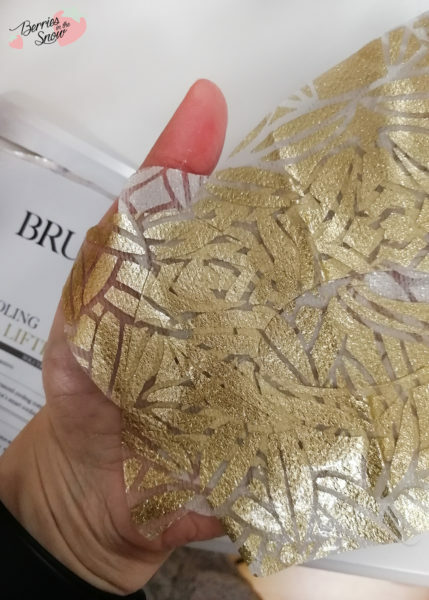 The sheet mask of this mask is made of a breathable gold foilgel sheet, which looks very pretty at first glance and also while wearing it on your face. The sheet has a good fit and stays in place for the time used. The ingredients are US FDA OTC and China CFDA registered. The key ingredients are Phellodendron Amurense Bark Extract, Paeonia Lactiflora Bark/Sap Extract, and Scutellaria Baicalensis Root Extract. Moreover, it contains Mentha Arvensis Extract, Hyaluronic Acid, Tocopherol, Adenosine, and Allantoin. I enjoyed wearing this mask and I also loved how posh it looked with the gold pattern. The sheet is divided into two sections, one for the upper facial half and one for the lower. This helps for a better fit and keeps the mask better in its place, too. It was recommended to use this mask for 10-20 minutes. It’s not possible to evaluate properties like wrinkle-care or lifting with one-time use of the mask, but it did make the face feel refreshed and had a noticeable cooling effect. Due to the cooling sensation, the skin feels more tight and plump as well. The BRUCKE Keep Cooling Hydrogel Soothing Mask is designed for long-time moisturizing and volumizing. It has cooling, whitening, wrinkle-care, moisturizing and soothing properties. The sheet mask of this mask is made of a thick hydrogel sheet, which has a grid structure to adhere better to the skin. The ingredients here are also US FDA OTC and China CFDA registered. The key ingredients are Phellodendron Amurense Bark Extract, Paeonia Lactiflora Bark/Sap Extract, Niacinamide, and Scutellaria Baicalensis Root Extract. Compared to the Foilgel Lifting Mask the ingredients list contains even more plant-based ingredients and extract, like honey, Mentha Arvensis extract, ginseng root extract, Morus Alba extract, chamomile extract and many more. The fit for this mask was good, too, and similar to the mask above, the sheet is separated into two parts to make it fit better. 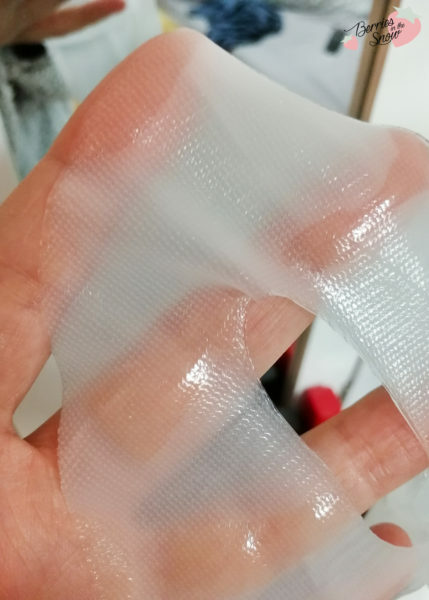 The hydrogel has a pleasant thickness but is still see-through. It was recommended to use this mask for 30 minutes. Unfortunately, I felt an unpleasant tickling feeling, so that I removed it after 15 minutes. This can be either related to any of the ingredients or that I had a bit of sensitive skin that day. Again, this is hard to evaluate, by only using one sheet mask, but I could definitely feel the cooling effect. According to the ingredients list, there are also a bunch of extracts that I usually enjoy a lot in my skincare, like ginseng, honey, or chamomile. 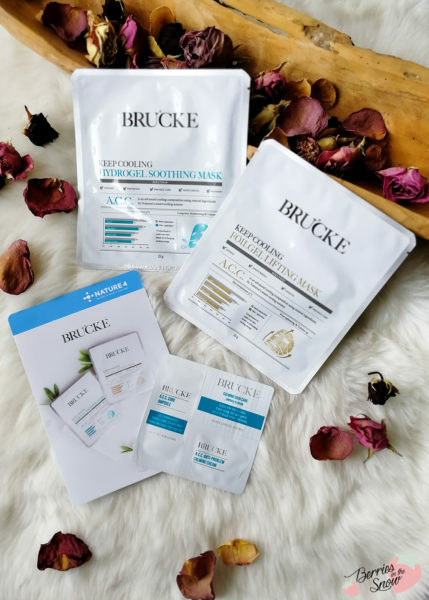 All in all, I enjoyed the fit of the two masks and I especially liked the BRUCKE Keep Cooling Foilgel Lifting Mask. I don’t know why my skin didn’t like the other one, but it is also hard to find who or what is to blame after only one use. You can either check them out from the official site or from Komawo. In my personal opinion, the price of almost 10€ is a bit too high, especially regarding the point that it is a one-time product. Other then that, I’m happy to see new and more unknown brands being licensed in EU. By the way, the online retailer Komawo is great if you are looking for Kbeauty brands that are EU licensed, this way you will avoid problems with customs, as well. Since they are based in Germany shipping is very quick, too. Free shipping starts from 40€. What is your impression of the brand BRUCKE? Just as a short reminder: All products mentioned and reviewed on this blog are of my personal opinions. This product here was sent to me for reviewing purpose by https://www.komawo.de which doesn’t influence me in providing my honest opinion on the products. those face masks look so refreshing to use lol the gold one though!! I haven’t heard of this brand yet but sounds interesting & worth a try. I hope it’ll be available in MNL soon as a see so many kbeauty products accessible here.